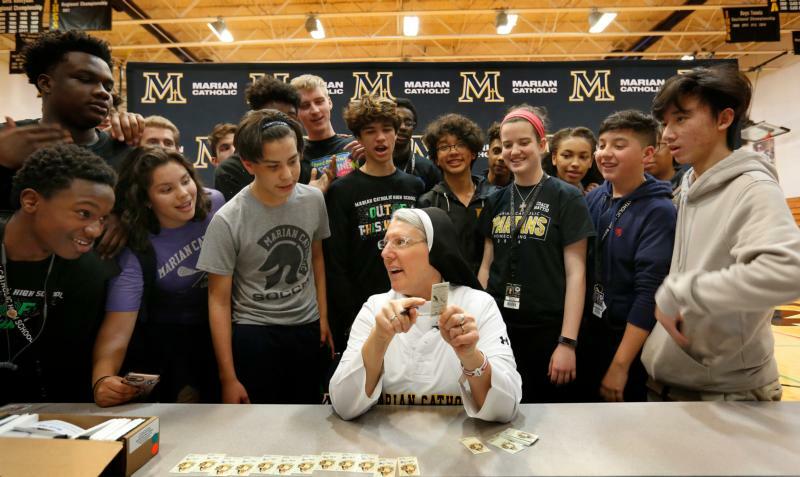 WASHINGTON (CNS) — The perfect pitch Dominican Sister Mary Jo Sobieck threw prior to a Chicago White Sox game last summer not only went viral but is still out of the park. Not bad for a theology teacher at Marian Catholic High School in Chicago. And in baseball terms, it’s a double, because the money she gets for the cards goes directly to her school’s scholarship program. Sister Mary Jo also gets to throw out the pregame pitch April 11 at Busch Stadium in St. Louis before the Cardinals’ game against the Los Angeles Dodgers, which isn’t bad for the sister who also happens to be a Cardinals’ fan. The image on the card is when she came off the mound pointing at White Sox pitcher Lucas Giolito, who caught her pitch. She is wearing a Marian Catholic T-shirt over her white habit with the number “60” on it for the school’s 60th anniversary. All of this fame might be new to the Dominican sister, but she’s hardly new to the sport that brought her to this level. In elementary school, high school and college she played softball, basketball and volleyball.